Szymon Radowicki (more usually known in Argentina as Simon Radowitzky) was born on either the 10th of September or November 1891 into a workers family in the Jewish community in the little Ukrainian village of Stepanice (Stapanesso). The family moved to the industrial city of Ekaterinoslav, because Simon’s father wanted his children to get a good education, and Simon received a rudimentary knowledge of reading, writing and maths. At the age of 10 he had to leave school to work as a blacksmith’s apprentice because of his family’s poverty. He had to sleep on a hard cot under his master’s dining table. From here, he heard the revolutionary conversations of his master’s daughter and her friends. At the age of 14, he got work in a hardware factory. He took part in his first strike for shorter hours, but was wounded in the chest by a sabre wielded by a Cossack at a street demonstration. He was forced to lie in bed for 6 months of recuperation. He was then sentenced to four months imprisonment for the distribution of leaflets. In 1905, during the revolutionary events, and despite being still only 15 years old, he was elected second secretary of the soviet of the factory where he worked. With the repression that followed the 1905 Revolution, Simon was forced into exile to escape being deported to Siberia. He arrived in Argentina in March 1908, where he got work as a mechanic. He read the anarchist press there, in particular La Protesta, the paper of the FORA, the anarcho-syndicalist union that organised among the workers. He associated with a group of Russian anarchist exiles that included the intellectuals Petrov, Karaschin, Ragapelov, Scutz and Buwitz and lived in a tenement with some of these. On the 1st of May 1909, he participated in the big workers’ demonstration in the Plaza Lorea. A cavalry detachment under the command of the police chief Colonel Ramon Falcon charged the crowd and twelve workers were killed and 100 seriously wounded. In the following “Red Week” Falcon pursued his terror against the workers. The police began to fan an anti-Semitic campaign against “Russian Jewish instigators”. Radowitzky, like the German Wilckens was a gentle soul and advocated the use of as little violence as possible in the revolutionary struggle. Like Wilckens, he was horrified and disgusted by the murders of workers and proposed to act. Falcon was returning from the funeral of the prison service, when Radowitzky, lying in wait along the route, threw a bomb into his coach. Falcon and his secretary were mortally wounded. Radowitzky was apprehended not far away. At his trial, the public prosecutor asked for the death penalty. Radowitzky’s cousin was able to produce a birth certificate that showed that Simon was only 18 and thus was excused the death penalty. The judge sentenced him to indefinite imprisonment, and to be put in solitary on bread and water for 20 days near the anniversary of Falcon’s death [for more details on this event see the article The Kind Hearted Executioner - libcom ed.]. Radowitzky gained the respect of both prisoners and jailers in the National Penitentiary where he was incarcerated. Following a breakout of 13 prisoners that included 2 famous anarchists, Radowitzky was transferred to the dreadful prison of Ushuaia in Patagonia in 1911. He was one of 62 prisoners transported there in the coalbunker of a ship. At the end of the voyage the prisoners were blackened with coal dust and their ankles ulcerated by leg-irons. At Ushuaia, Radowitzky showed immense strength of character. He stood up to all the humiliations and indignities meted out, and moreover, became the spokesperson of all the prisoners, leading hunger strikes and “protest choirs”. When the prison officials realised his standing among the prisoners they increased their torments. Lanterns were swung in front of his face every half hour at night. He was anally raped by the deputy governor and 3 warders in 1918. When the anarchist movement in Buenos Aires heard this, they launched a campaign, covering the walls with messages demanding his freedom and publishing a pamphlet on the treatment he had received. Radowitzky “the martyr of Usuaia” became the subjects of songs sung by Creole payadores (songsters) at workers’ meetings and assemblies. The liberal press took up the call for his freedom, but it was not forthcoming. Tired of waiting, some anarchists planned his escape. In league with a smuggler, they got Radowitzky on board his schooner. But the Chilean Navy intercepted them and Radowitzky was returned to prison after just 23 days of freedom. He was punished with solitary confinement and half rations up to January 1921. The campaign to secure his release continued. Finally in 1930 after 20 years of hell, Radowitzky was released. Expelled from Argentina, he took refuge in neighbouring Uruguay, again taking up the work of a mechanic. 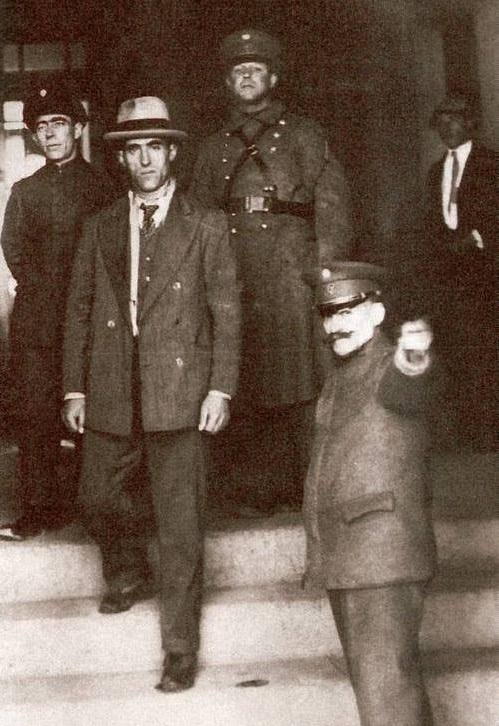 His involvement with the anarchist movement there and the struggle against the dictator Gabriel Terras in 1933 led to his arrest and deportation to the isolated Isla de Flores. When the Spanish Revolution broke out, Simon headed for Spain in 1936. By now he was in his mid-forties and in poor health. He went to the Aragon front where he fought with the anarchist 28th Division led by Gregorio Jover. Here he met Antonio Casanova, originally from Galicia in North Spain, who had emigrated to Argentina at an early age and had been one of the founders of the Federación Anarco-Comunista Argentina in 1935. The two became good friends. Later Simon worked in Barcelona for the cultural division of the mass anarcho-syndicalist union, the CNT. At a time of strict rationing he happened to get hold of a bottle of milk that he immediately gave to a pregnant woman that he felt needed it more than him. With Franco’s victory, he had to flee to France, where like so many others, he was interned in the concentration camp at St. Cyprien. From there, he got away to Mexico. Here, a poet managed to get him a job as a clerk at the Uruguayan Consulate. At the end of the World War, he worked in the Mexican branch of the International Rescue and Relief Committee to help political refugees in Europe, alongside the German anarchist Augustin Souchy, sending CARE food packages. He wrote for anarchist publications in Mexico. Simon’s last years were plagued by ill health. The prison years had taken their toll. When not in hospital, he lived in a shabby attic of an apartment building. He died of a heart attack on February 29, 1956 whilst working in a toy factory. “With Radowitzky’s passing one of the last social revolutionaries of the Russian Revolution of 1905, one of the finest idealists of the international labour movement was gone.” - Augustin Souchy. Postscript: In November 2003, a popular assembly, meeting in the Plaza named after Ramon Falcon, voted to change its name to that of Simon Radowitzky. Radowitzky looks real mean, as though he could have been an extra in The Godfather - his life is of course much more impressive than any film. I vaugely recall reading how he was actually a gentle man. But died poor and physically broken. I have learned of your propaganda and posters, in which my name figures demanding my freedom. As an anarchist I say to you: I declare that I don’t wish to be the propaganda instrument on any political party, including the Communist Party, whose support of the policies of the Russian government is absolute. In the name of the anarchists prisoner in prisons and Soviet Siberia; in the name of the destroyed anarchist groups whose propaganda is prohibited in Russia; in the name of the comrades executed at Kronstadt; in the name of our comrade Petrini who was handed over to Italian fascism by the Soviet government; in the name of the Argentine Regional Workers Federation and the Uruguayan Regional Workers Federation; in the name of our comrades killed in prison by the Bolshevik government; and in protest against the calumnies and defamation against our comrades Kropotkin, Malatesta, Rocker, Fabbri, Makhno, etc, etc, I declare that as an anarchist I reject all of your support, which represents an unworthy exploitation on the part of the Bolshevik leaders of the party and the CGT of the generous sentiment of solidarity shown me by the working class. It was a ferocious, but completely cowardly attack, because without prior warning, the Colonel ordered the police to open fire on the crowd of workers. Anyone know which it was, or was it both, or is it one of those historical events thats a little unclear? also, the dates in his youth are a bit confusing - he was born september/nov 1891, and got a job in a factory aged 14, so in september/nov 1905 at the earliest, then got a sabre wound and a prison sentence that took him out of things for 10 months, but was also elected the factory soviet second secretary in during the 1905 events, whilst age fifteen (ie in sep/nov 1906 or later)? "I suggest shooting randomly into this crowd of unarmed families"
"Are you mad?! We have to shoot them, THEN charge horses over them as well, or whats even the point?" The state of these people, honestly. Thanks Battlescarred. Do you know anything about my confusion around the dates that i edited in?